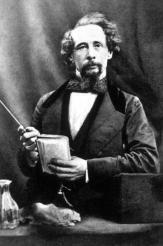 Charles Dickens largely wrote about the times of his own childhood and the England of his own day. But in two of his most ambitious novels, Barnaby Rudge (1841) and A Tale of Two Cities (1859), he turned to the late eighteenth century explore the resonances of two great revolutions (American and French) and of how the rise of ideologies of both Left and Right ignited a tumultuous epoch which was both “season of Light” and a “season of Darkness,” changing the lives of men and women of all social classes. This seminar discovers a different Dickens, one who in venturing from his usual territory asks questions that still resonate today. Prof. Birns recommends the Oxford University Press editions of both books – Barnaby Rudge edited by Clive Hurst and A Tale of Two Cities by Andrew Sanders. To register, use the form below. (If you're a member, log in first.) Please click the Register button only once. The website may take a moment to process your registration and show the confirmation screen. With registration questions, contact the Events Office at 212.288.6900 x230.